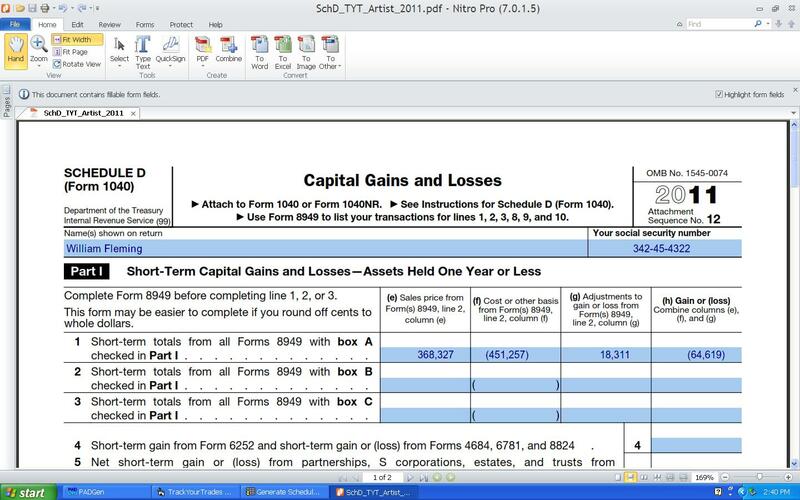 Track Your Trades software automates the tedious process of completing IRS Schedule D (Capital Gains and Losses) for your tax return, saving you TIME and MONEY! No more angst over wash sales, cost basis, date acquired, etc. Will generate completed Schedule D for ANY tax year, 2005-present. If you trade stocks, options, or mutual funds, you need Track Your Trades! Users can either print the Schedule D report for mailing, or export it to TurboTax, H&R Block At Home, or Excel for e-filing. Trades can be manually entered, or imported via a CSV file downloaded from TD Ameritrade, E*Trade, Scottrade, Fidelity, Schwab, or similar online brokerage. Track Your Trades stores trades from one or more brokerage accounts in a single consolidated file, allowing easier tax reporting from your PC or laptop. Track Your Trades also contains tools to support tax planning, including a What-If Wizard, which helps users find opportunities for strategic tax-loss selling. Now with Internet features, transaction detail reporting, enhanced import capability, and Form 4797 for Mark-to-Market traders. Mac Cleanse will purify your system and protect your privacy. Monitor multi PC activity, Internet use, track,analyze application running time. Keep your golf scores and track golf statistics and averages like handicap. Qweas is providing links to Track Your Trades 2011 as a courtesy, and makes no representations regarding Track Your Trades or any other applications or any information related thereto. Any questions, complaints or claims regarding this application Track Your Trades 2011 must be directed to the appropriate software vendor. You may click the publisher link of Track Your Trades on the top of this page to get more details about the vendor.